Ground Fault Circuit Interrupter (GFCI) outlets are used to reduce the risk of electrical shock by shutting off the when it detects an electrical current is flowing through an unintended path such as a person or through water. The GFCI outlet measures the electrical current flowing from the hot conductor (the shocky copper wires) through the neutral conductor (the not so shocky copper wires). If there is a difference in the flow of the current, i.e. a toaster in a tub of water, the GFCI will shut off the current to prevent a shocking situation. After removing the toaster from the water, the outlet must be manually reset to turn the outlet back on. Do this by pushing the button that has reset printed on it and you're good to go. If the outlet keeps turning off (tripping) there is something wrong and the problem should be identified. So now that you know what a GFCI outlet is and the benefit it provides while taking a bath and making toast, where do they belong? To make it easy for you - every outlet in the kitchen (exceptions apply), outlets within 6 feet of a sink tub or shower stall (bathroom, wet bars, laundry areas), garage, basement, and on the exterior of your home should all be protected by a GFCI. This does not mean that every single outlet you have in those areas needs to be a GFCI outlet, just protected by one (I will get into that in just a moment). There are some exceptions however. Those exceptions are outlets that serve a dedicated appliance like a refrigerator in the kitchen or a freezer in the garage due to the fact that some of the components will cause the GFCI to trip. Just to throw a kink in there, here is an exception to the exception for dedicated appliances. 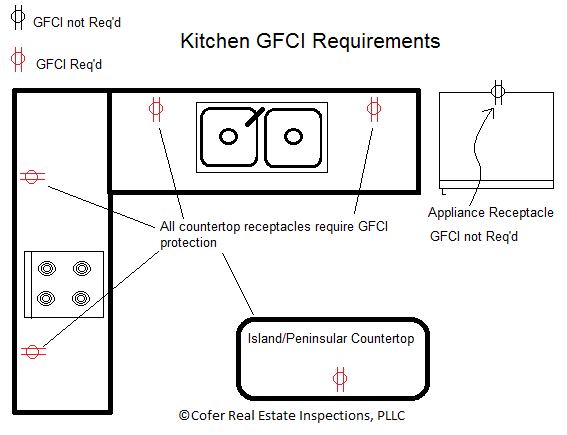 As of the latest and greatest of the residential code makers (2014 National Electrical Code), a kitchen dishwasher branch circuit (hard wired or corded) shall be GFCI protected. This applies to homes built after the code has been adopted in the jurisdiction the home was built in. Many cities run a few years behind on adopting codes that have been recently put out. It can get extremely confusing. Maybe just throw some GFCI outlets around your home and hope they work. Just kidding! Let the licensed electricians handle it. Earlier, I mentioned, that not every single receptacle needs to be a GFCI type plug just that it needs to be protected by one. You can protect multiple plugs that are wired on the same circuit (daisy chained) with one GFCI receptacle at the beginning of said circuit. You can have the GFCI plug in the garage and all the exterior plugs are then wired into that plug and will be protected by the GFCI receptacle. Plugs that are not GFCI receptacles but are on a circuit protected by a GFCI should have a little sticker that says "GFCI Protected". All Jokes aside - Electricity is extremely dangerous. Do NOT try to make toast while bathing or even try to put a toaster or anything electrically operated in water. You can and most likely will kill yourself or someone else. It is always best to consult with a licensed electrician before handling any electrical items such as GFCI outlets. If you read this and do not heed my warnings I cannot assume or take any liability for your actions. So hire a licensed electrician to do the electrical work. 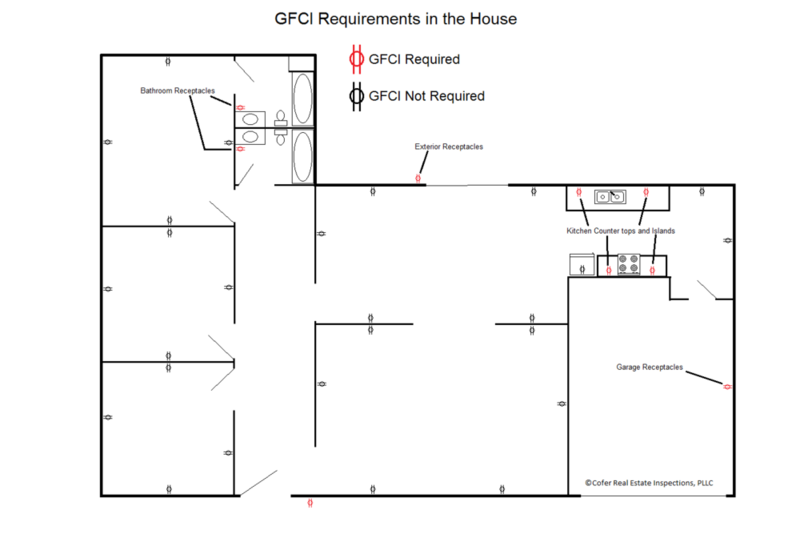 Here are some fancy diagrams of what outlets should be GFCI protected in and around the home.